I know some people are already embracing the fall spices that are imminently upon us, but I want to hold out awhile longer. Sure, I may have just gone and bought new stocks of ginger, cloves, and all spice to make sure I'm ready to go for pumpkin season, but no! Not yet! It's not even October yet, for goodness sake. It seems like each year the holiday season starts earlier and earlier. Not that I don't like the holiday season, but it does invite early burnout. You don't want early burnout! So. I made some Banana Crumb Cake. It's not exactly summer, it's not exactly fall, it's perhaps somewhere in between, which is right where we are here at the end of September. I edited this recipe down a bit from the original on Cookies and Cups. It was a bit too much sugar for me, and reducing the sugar from 2 cups to 1 1/3 cups did not make the cake unsweet in any way. In fact, I would never have known it was meant to have more sugar if I didn't see the recipe. I also halved the crumb entirely. Three sticks of butter and another two cups of sugar in one cake just seemed on the high side to me, and even though I really do love me a crumb topping, I figured it would be fine with half. And it is! You can, of course, go ahead and double it to have a much higher percentage of crumb, but I'll leave that up to you. There's something sort of magical that bananas do to baked goods. They just add so much extra moisture it makes cakes and quick breads all the more delicious. And even better, they get even more tasty on the second day, which is not something you can say for many baked goods. Maybe I'm just having a love affair with fruit of the banana/plantain variety lately, because I also can't seem to stop eating Plantain Chips. Which is funny because bananas by themselves are sometimes too much. Ah, taste buds, you are strange and wonderful. Anyway! 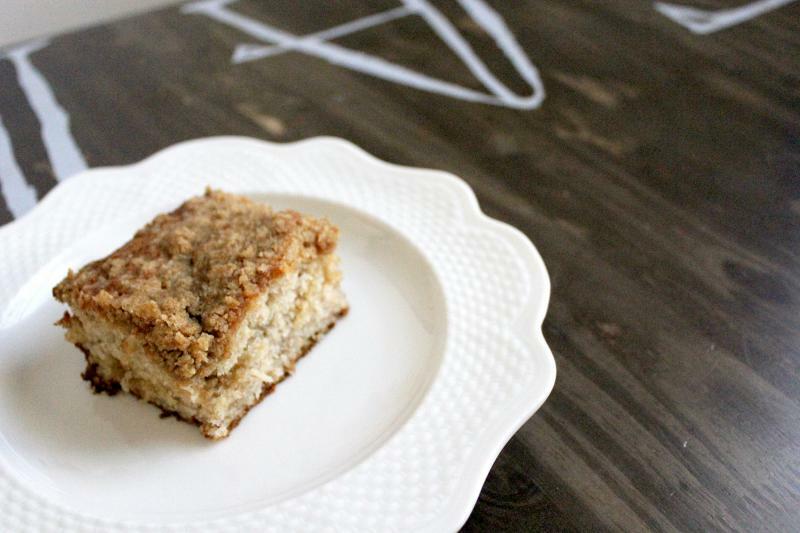 You should definitely try out this banana crumb cake, especially if you like any kind of banana baked good at all. You will not be disappointed! Great for breakfast for dessert, with a delicate banana flavor that doesn’t overwhelm. Preheat oven to 350°F. Spray your 9x13 baking dish with some cooking spray and set aside for now. I recommend making your crumb first. Combine 1/2 cup cold butter, brown sugar and 1 cup flour in a medium bowl until a coarse crumb forms. You can use a pastry blender or cutter, or a fork, or even your hands. Set that aside for the moment. In a large bowl, mash the bananas until liquidy. Beat in the butter until combined, then mix in the sugar, eggs and vanilla. Stir in the milk and flour until just combined. Pour 1/2 of the batter into your prepared pan. Top with 1/3 of the crumb mixture, then pour the remaining batter on top, and the rest of the crumb mixture on top of that. Bake for 50-55 minutes until the center is set and a tester comes out clean. Cool for 10 minutes, then chow down. It's good warm and at room temperature. Ooh I like that this has a cake-like crumb and texture instead of banana bread. I sometimes get tired of banana bread and try to experiment with adding different things (such as chia seeds, different dried fruits, nuts, etc), and this cake would be perfect to make for a change of pace! Yes! I didn't even know that I loved banana-flavored stuff until a few years ago. Totally missing out. Looks like an excellent recipe! I think I will try it today! 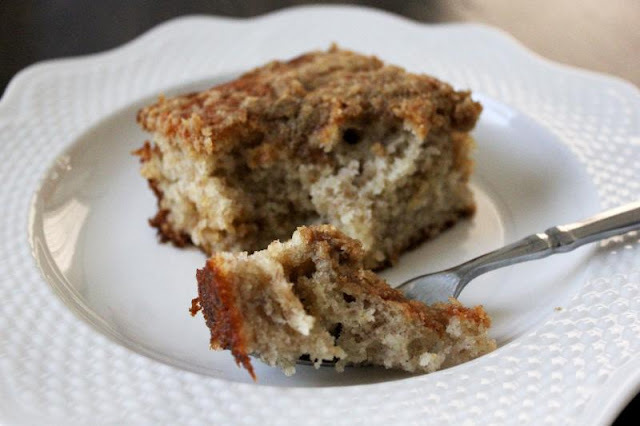 I like to put chopped walnuts in banana bread so I think adding chopped pecans or walnuts would be a really good addition, either in the cake batter, or in the topping mixture. Baking is soothing, sort of like meditation. Eating fresh baked treats makes everyone happy. 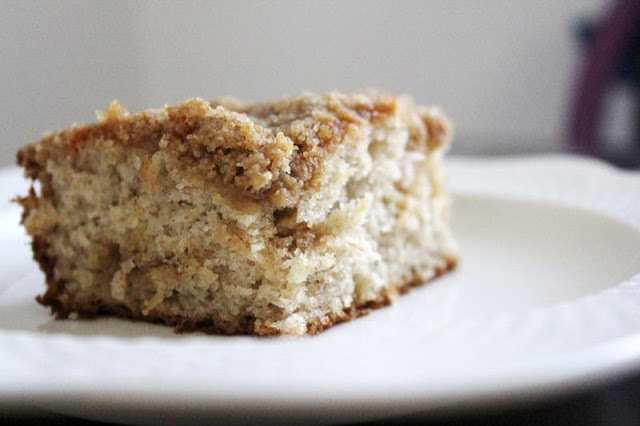 Thanks for this wonderful Banana Crumb Cake recipe.